I just got laid off! Now what do I do? The Career Brand > Blog with Image Left > Branding > I just got laid off! Now what do I do? You can’t believe it! You were just informed that YOU were being laid off. You have spent years dedicating countless hours working hard and delivering results and now you find yourself in an unusual situation. Where do you go from here? Brand Expert Latrice Collins hosts a four part series that will provide tips and techniques to point you in the right direction. This is the second episode in the “Job Hunting Mastermind Series”. 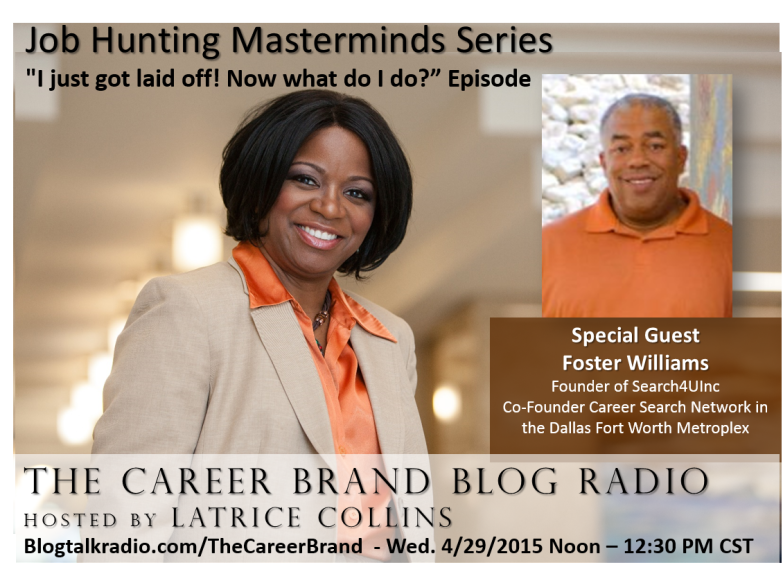 This week’s guest, Foster Williams, is the Founder of Search 4 U Inc. and Co-founder Career Search Network. What are key things to do once you are notified your position is being eliminated? If you are looking to land a new opportunity in the near future, this series is just for you.